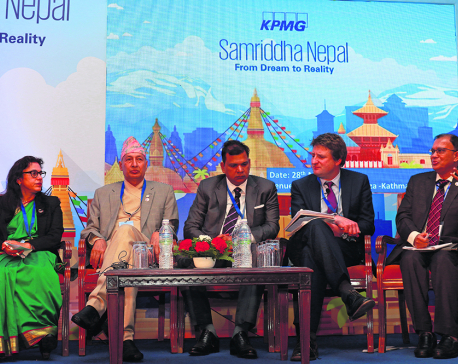 The government is hosting Investment Summit starting from Friday in Kathmandu at a time when it is being criticized for not being able to create an investment-friendly environment. How is this summit important for us? How’s the preparation for this mega event? And what’s the state of our economy at the moment? 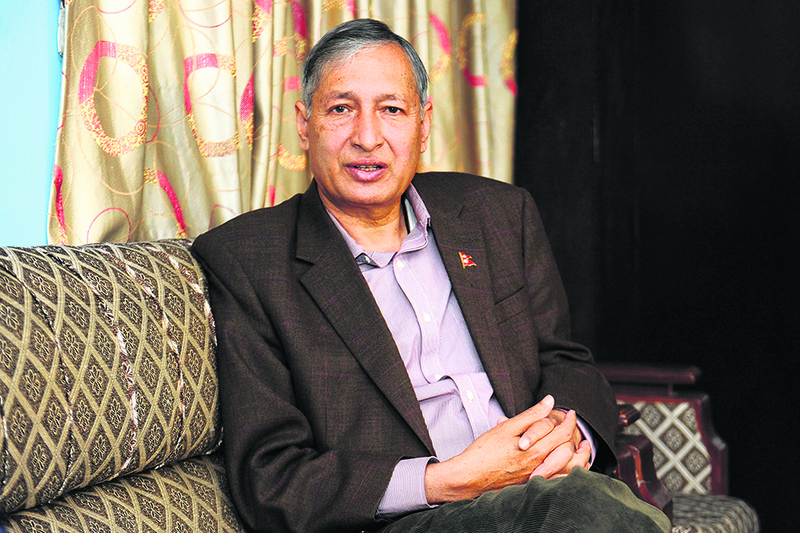 Minister for Finance Dr Yuba Raj Khatiwada shared his views with Mahabir Paudyal and Sagar Ghimire on the eve of Kathmandu summit. We held Investment Summit two years back. Why is the government going to organize yet another summit just in two years? What is the rationale? Two years is not a short time in Nepali political history. In two years, many things have changed. For one there has been a system change, the government change and changes in several business opportunities. Let me start with the kind of political regime we have now. Two years ago, we only had the constitution. We did not know how this constitution would be translated into operation and action and how we would manage the roles of provinces and local governments. There was uncertainty regarding whether the elections would take place and whether political stability would follow. But in one single year, we held all elections and formed stable governments. We have been able to smoothen federalization process. We need to tell our investors that we have firmly entered into proper federal set up. Second, we have initiated major legal reforms. Two years ago, when we had the investment summit we only had Industrial Enterprise Act. We did not have much of labor law related reforms. Issues related with foreign investment and technology transfer and public private partnership (PPP) were yet to be settled. Even if we had Industrial enterprise Act its bylaws were not enacted. Now we are in a better position and ready to provide better legal and regulatory framework. We are in a different situation now than when we held investment summit two years back. Third, we have better business opportunities now. Two years before, we were not sure if we would be able to do away with electricity load-shedding. We thought this problem will remain perpetually. Somehow we have been able to eliminate it. The other change is related to tourism infrastructure. We did not expect our tourism infrastructure to develop this fast two years back. We have the second international in Lumbini and another international airport in Pokhara almost ready. These airports have provided a lot of opportunities and scope for tourism industry. We have also announced Visit Nepal Year 2020 targeting to bring over 2.5 million tourists. Tourism colleagues say they can accommodate about 2.5 million tourists in the next couple of years. Fourth, there is growing connectivity between Nepal and its neighboring countries. We did not expect Tatopani pass to come to operation two years ago. Now it’s going to come into operation pretty soon. Other passes are in progress. With India, we have more road and railway connections now than in the past. Better connectivity with India and China will open more opportunities for investors to explore markets across the border. Fifth, our government has laid much emphasis to take along private sector in development process. We have to show to our investors that we are private sector friendly and want to work hand in hand with private sector. With stable political regime and development vision, and better predictability of tax regime we can assure the investors that there would be no reversal in our policy reform. This was not the case two years back. We were still enacting laws. We did not know what kind of tax system would be evolving and what kind of overall tax reforms the government will bring. Now we are clear on those fronts. Finally, the growth momentum we are having at the moment is remarkable. We never thought in the past that we would be growing by more than five percent. Our average growth for the last two decades was four percent. Now with the consecutive third year of high growth and domestic market expanding people are expecting to invest more. Just in two years time, there have been a lot of changes. We have to share these changes and opportunities with the investors. Also we have to build on what we did in 2017. How is the preparation for the summit? How have been the responses so far? We are having 650 participants from abroad. Larger number is from China and India. There will be significant number of participation from the US and EU countries. Despite having issues with capacity to invest abroad and Brexit, we are still getting a significant participation from EU countries. There are still more investors willing to enroll. We have said registration is over but we are getting pressure to enroll more. If we allow more enrolment the number of participants will cross 700. The preparation is much better this time. We have finalized six or seven areas of investment covering around 70 projects, several of which have already come under the interest of investors. We will see what kind of investors would be best choice for us. In terms of preparation and participation, it’s pretty much encouraging. High dignitaries are participating and sharing their perspectives on investment. Three vice presidents from World Bank group and vice president from Asian Development Bank are coming. Most diplomatic missions will also be present. On the whole, there is a good response so far. Let’s see how this translates into real investment. We will have to assess that after the summit. There are reports that American ambassador to Nepal won’t be participating because Americans are apparently not happy with the government. You can see that Nepal and America have a good relation. There is good support coming in from the US to Nepal. We have been implementing projects under the Millennium Challenge Corporation (MCC) and US aid is growing. And we have a lot of bilateral avenues to improve our trade relations. People have different rumors but I don’t think there is any truth behind such rumors. In the previous summit, there was commitment in the form Letter of Intent (LoI) from the investors for over 1,300 billion rupees investment. But much of that fund did not materialize. How can we expect things will be different now? I don’t know how that commitment was publicized in 2017 summit. There were no projects and no proposals. I was told that there was simply a form for the investors to put their names and amount they wanted to invest. That was a kind of wish list. This time we do not produce any wish list. For projects which are mature, we will do MOU. About a dozen of projects will be signed, MOU will be done and investment will start coming in. After you choose the project you also have to follow so many formalities. It cannot be like you choose a project and they agree to invest and the next day money comes in. We don’t want to make it like a project fair. Compared to the previous summit when not much follow up took place, because there were two or three governments in between, this time we have set up a mechanism to follow up right from the next day of summit. Things are going to be different this time. You have to be constantly in touch with the potential investors, try to understand their problems and interests and address their concerns. Precisely for this, Investment Board has been empowered more with PPP Act and Investment Act. Second aspect is the threshold of investment. Investors had to go through different ministries for larger projects in the past. They had to visit at least dozen of offices. 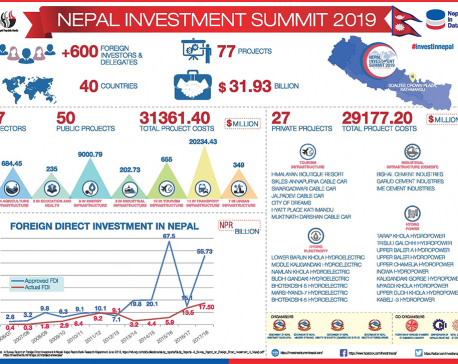 Now with one stop service being provided from the Investment Board, it will be easier also to monitor the progress and bring in more of their interest to Nepal. This marks a fundamental change. This should help us to get better success compared to previous summit and the commitment that was expressed. I believe this summit will become a game changer for Nepal. The government has introduced many laws and regulations. But there are complaints that parliamentarians did not get adequate time to discuss and deliberate on those laws. There is a defined process of endorsing the bills and enacting laws. First we table the bill then the discussion follows. Then the bill goes to the committee where it is discussed again. There was a lot of discussions among parliamentarians and the members of the committee. So I would not say the parliamentarians did not get adequate time to discuss the matter. If there are rooms for improvement in these laws, parliamentarians and the government are always there to improve them. If there are shortcomings, they are always subject to revision. Let’s discuss the state of economy. Some economists have painted very bleak picture of our economy. Where does our economy stand at the moment? We are growing consecutively in third year with a rate of seven percent or above. When the economy is growing consecutively at this rate, there must be good things happening in all sectors. The growth of the economy comes from different sectors like agriculture, manufacturing, service, trade, transportation and construction. If every sector is falling and only the economic growth rate is going up, where is such growth coming from? The kind of growth we are generating often has the risk of coming with high inflation coupled with the high unemployment rate. But, we have been able to maintain low inflation. Sectoral analysis shows that we are also creating jobs. This indicates that the economy is growing with a moderately low inflation and high opportunity for jobs. But the balance of payment is continuously on deficit for the past few months and the foreign exchange reserves of the country is also depleting. When you want to grow very fast, you have to import more capital goods, construction materials, industrial raw materials, transportation goods and machineries and parts. This will put pressure on imports. So, imports are growing. If someone wishes that we could produce every capital good in the country, I would love that. But it is a sheer wish. The structure of production makes it difficult to control import. You are growing fast means you have to incur some trade deficit. Now you may ask why I was not able to address these issues or produce more goods and services within the country. That is fundamental and structural issue and you cannot fix this problem in one year. Trade deficit is bound to widen for some years if you want to grow very fast. In medium to long term, what we can do is perhaps substitute some of our imports, particularly in construction materials. We have started providing incentives to our exporters through export subsidies and other measures. But it takes some time to get results. Our service payment is even higher. When we want to tame some of these outflows of foreign exchange, like in education and health, we also don’t get very positive responses as accusations are made that government is becoming restrictive. External sector is the only issue wherein we have some pressures. On fiscal and financial fronts, where do you see the problems? But look at the stock market. It’s on a bearish trend in recent months. If somebody wants to judge the performance of the government through the stock market prices, that’s the different story. Let them do that. We don’t bet ourselves to what happens in the Nepse index. We need to provide an enabling environment for share prices to keep stable and grow. That’s our job. Otherwise, Nepal is going to be a country where the non-performing asset of the banks is one of the lowest in South Asia. People complain about the liquidity [loanable fund] shortage. If the economy that is growing at a rapid pace was having a flush of funds, was that a comfortable situation? No. In a growing economy, there is always a crunch for fund and you have to find out more resources. I would say this is a ‘happy problem’. Happy problem means growing fast and investments coming in good areas. That means we have to create more liquidity in the system to cater to the growing demand for investments and higher growth. There is a little spike in interest rates. You cannot simply say interest rates should go down and investments go high. When there are more demands for investments, there is pressure in the interest rates too. Insurance sector is growing fast. Banks are making impressive profits. Also, companies listed in stock exchange are doing well. On the fiscal front, we have maintained our fiscal balance. We are raising revenue with a growth of 25 to 26 percent. We don’t have to borrow from the domestic market so far. We have been able to run the government even without borrowing. Our revenue and other resources are so far enough to finance our expenditures. On the whole, the fiscal side is on balance and financial system is doing well, except for the external sector but this is not the problem created by this government. The economic fundamentals are good. In a growing economy, resources are never sufficient and [foreign exchange] reserves are always in pressure. That’s fundamental of any economy in the world. There was a lot of optimism when you became the finance minister. Today many call you inefficient minister. Why? If there is a kind of notion that Finance Minister should be able to siphon off resources and breach the financial discipline, I am totally inefficient on that. I can only do best and honest things that deliver results. I don’t look for next few months and do populist works before I leave. I want to stay in the system. I want to be stable on my perspective and views. The kind of stable policy regime that I want to create to strengthen the foundation of the economy will be known after some time. When I presented my budget, people criticized so much. Later on, they started realizing that this budget would help create more jobs, provide wider range of social security and orient the development process to grassroots level. On share index criticisms, we have to create stable and stronger fundamentals for the stock market. Most of the companies listed on the stock exchange are banks and financial institutions. Who did all the financial reforms to create stable and stronger financial system so that people are betting their money on those banks? Don’t they remember the ex-governor of the central bank? Many of the banks were almost failing. When a person created a kind of environment whereby they can play around the shares, why should they not trust the person in other capacity? As a Finance Minister I am also regulating insurance market through Insurance Board. When three-fourths of the share market transactions are of financial institutions, what hinders putting better price on their shares? The only issue is the shortage of money. People don’t have money because interest rates are high. At the moment, we don’t have easy money when you borrow at interest rates of 6 or 7 percent and you bet in the stock market. We have to tell investors to have a long-term portfolio investment and be able to hold shares. It’s not that you gain in share market every day. I urge investors to keep patience and look for better liquidity condition to come so that they can access more fund for investment. The capital spending is poor even in the current fiscal year while you seem to struggle to meet revenue target. If I want to get the target of revenue by hook or crook, there are ways. But, I don’t want to do that. We are comfortable at the current revenue growth rate. Compared to what used to be not more than 20 percent revenue growth on an average, we are still above the past rate. I don’t think that’s an issue. On expenditure side, there is capital component in current expenditure as well as financing arrangement. For example, some of the big projects go under financing expenditure heading. Also, some of our grants transferred to local levels for development expenditure are also under current expenditure. The capital spending is 25 percent. If you look at the wider gamut, there is not a disappointing situation. The reason why we are not being able to spend more capital budget is due to a couple of projects. We were planning to complete Melamchi project this year. Budget on projects like Fast Track was under-spent. Many provinces and local governments have not got sufficient manpower, organization, structures and laws. It took seven or eight months to bifurcate our responsibilities between the center and the provinces. We had to make so many laws. It took more time. You can criticize us on that. The size of capital expenditure as we see in the statistics doesn’t necessarily reflect the work we have done in the field. Then there is payment issue. I have asked my colleagues to check which of the projects are ready to get payment in terms of their physical achievements. It’s also a matter of our work culture. At the end of the fiscal year, we will be spending all the money, except for the few which were under the conditional loans from our development partners. I don’t know under what conditions we were able to agree on kinds of loans from Exim Bank with tough conditions including 60 percent of import contents from them. Finally, can you update us on post-earthquake reconstruction works? What is progress? Reconstruction of residential houses is going well. Most of the households should take the third installment of the housing grants by the end of current fiscal year (2018/19). That would require Rs 200 billion for us. It’s a big challenge. We are looking for more support from our conventional donors like World Bank and other bilateral partners. What would happen if previous government’s decision of adding more housing grant and adding more people into social security scheme had been implemented? It would have been a total collapse.